This page has been viewed 42 times this month, and 6090 times total. Cartoon Characters: Sinbad the Sailor, Marina, Proteus, Eris, Kale, Spike. Voice Actors: Brad Pitt, Catherine Zeta-Jones, Michelle Pfeiffer, Joseph Fiennes, Dennis Haysbert. Directed By Tim Johnson, Patrick Gilmore. Produced By Jeffrey Katzenberg, Mireille Soria. Animated By Glenn Storm, Alexander Williams, Jakob Hjort Jensen, William Salazar, Dan Wagner, Rodolphe Guenoden, Bruce Ferriz, Serguei Kouchnerov. Originally Released on June 27, 2003. Production budget estimated at $60 million. Do you have anything to add to this page? 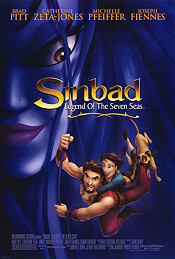 Have we made any mistakes... or do you have any additional information about Sinbad: Legend Of The Seven Seas? If so, we would love to hear from you. Please send us a quick note with your additions or corrections to this page, and we will make the corrections as soon as possible! Below are comments about this cartoon submitted by people who have seen this show. Take a look and see what others have said about Sinbad: Legend Of The Seven Seas. We want to know what you think, too!! Feel free to share your own opinion- we do want to hear from you! You can add your own comments here. 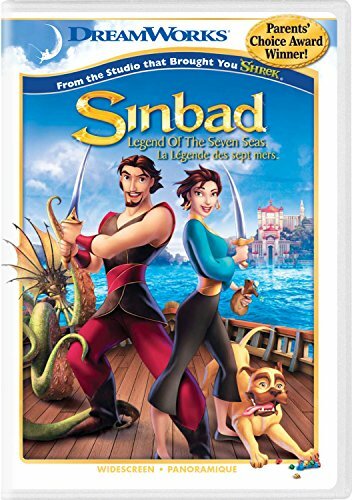 Sinbad: Legend Of The Seven Seas by Big Cartoon DataBase is licensed under a Creative Commons Attribution-NonCommercial-ShareAlike 4.0 International License.